Home Wearable News Samsung SM-V100T Mobile Hotspot Pro review – 2014’s leading T-Mobile hotspot? 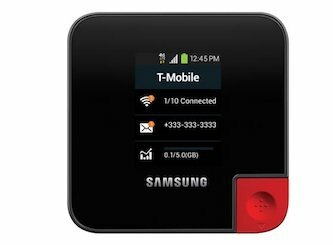 Samsung SM-V100T Mobile Hotspot Pro review – 2014’s leading T-Mobile hotspot? In the age of super-fast mobile internet, powered by 4G and LTE, the smartphone modem is increasingly becoming a must-have gadget. Today we turn our attention to the Samsung LTE mobile hotspot pro. With fast speeds and a refreshingly potent battery life, this is an easy editor’s pick as the must-have cellular modem going into 2014. Let’s dive deeper. The first thing to make you aware of is the fact that the vast majority of the configuration is done via a simple to use internet interface. The device itself is a fairly basic black box, but the online portal allows you to tweak the settings quickly and easily. This ‘web interface’ does not require a live internet connection to be accessed and used. Despite the fact that no internet connection is required, the online interface is painfully slow. We witnessed page rendering times in excess of 2 seconds, which is frankly quite bizarre considering the fact that no internet is involved. As such, the coding behind the software leaves a lot to be desired, as this is clearly lower quality software causing the slowdown. Once you’ve got the system to load, you’ll find a collection of the usual internet security and network settings. This system allows you to access features like port blocking and forwarding, MAC filtering and WPA2 security. In places there are limitations though, as the WPA2 security is the only type you can access. Due to the LTE hotspot pro having such a potent battery life, you are actually able to use the device as an emergency charger whilst you browse the net. So if you connect your smart device via the micro-USB cable, the hotspot pro will begin the charge you’re device. This is useful in the age of half-day batteries but does carry ramifications for the longevity of the cellular modems own battery life. Whilst this feature can therefore be interpreted as being slightly strange, the counter-argument is that you can only browse the net for as long as all of the devices are in sync and charged, so if this feature averages out the battery life between the (for example) smartphone and modem, then we feel it’s worthwhile. There’s little point having a modem that can run for hours but a smartphone which will only last 40 more minutes – much better to instead have the whole system working for say three hours. Finally, the hotspot acts as a virtual hard drive where you can store data in the Android powered folders. So when you hook the device up via MTP you get 2.6GB of internal storage to play with. The device can also be used to check SMS messages. We found the Wi-Fi connection to be easy to establish and secure once connected. We recommend using this setup because the USB method is a lot more involved, including the need to install drivers, go through a disconnect-reconnect process and then to navigate through the web interface in order to access USB modem mode. The pros of doing it this way is the battery charging and the faster internet connection. So this choice will largely depend on how long you’re looking to use the device for. A quick 20 minute web browse and checking of the emails may suit the Wi-Fi method, but heavier online lifting would warrant the proper setup. The SM-V100T is not a compact smartphone modem, as much as these devices come compact. In that sense, it’s not something that you’re going to slip into your pocket. It’s a 3.53 x 3.53 inch square device, which is half an inch deep and weighs in at just over 5 ounces. A lot of the additional bulk is owed to a largely unnecessary LED screen. As much as an LED screen may be a decent ‘nice to have’, the major problem with this one lies in the fact that you cannot control it. It’s therefore a useless battery sapping element which could have been left out. In terms of function, this screen shows you how many of your devices are currently connected and how much data they have used. Whilst these functions are required, we feel that the web interface could have been purposed to achieve this, saving some critical bulk. Other such devices allow for settings to be changed from the device itself – so the fact that Samsung have not gone this path opened up the opportunity to build a great interface and to keep the device physically very compact. The USB to micro-USB socket sits in the lower right hand corner of the device. Below that is the MicroSD card slot. The devices performance is obviously intrinsically tied to the performance of your cellular provider, in your region, at that moment in time. So ensure that you have mobile signal coverage in the area where you plan to use this device. We were seeing neatly eleven hours of audio streaming over LTE, which is a staggeringly successful test compared to other devices. What’s more, this could be achieved by moving as far as 100 feet away from the device on Wi-Fi mode. The main thing, of course, to keep an eye on though is the data usage. With the fast connection and long battery life it’s easy to forget that you’re using mobile internet, and the networks charge plenty of cash for going over your date caps. In conclusion, this is a powerful T-Mobile hotspot which delivers good speed, good battery longevity and good performance. It has its flaws, but we believe that this is a very solid pick for any T-Mobile customers.